The hobby is riddled with the remains of overprinted sets from the 1980s. Closets are clogged with their carcasses. However, 1984 Donruss Baseball isn't one of them. One of the decade's most popular sets, it's one of the few sets that still sees big demand from collectors today. 1984 Donruss Baseball is a 658-card set, 651 player cards and seven unnumbered checklists. The design breaks away from the ones used in the previous two seasons. The bat-based nameplate is replaced by a bolder white wave that has the team name and Donruss logo. The player's name is underneath. Strong photography, particularly when you compare it to the pictures used in other early Donruss sets, also increases the set's appeal. The 1984 Donruss Don Mattingly is easily the most popular card in the set. In fact, it's one of the most recognizable rookie cards of the decade. Although prices are somewhat softer than they once were, it's still an easy sell on the secondary market. Other rookies include Joe Carter, Andy Van Slyke, Ton Fernandez, Sid Fernandez and Ron Darling. 1984 Donruss Baseball isn't without its quirks. All 26 of the Diamond Kings have two versions. Error versions have Frank Steele's named spelled "Steel." The error was created, leaving 26 variations. The corrected versions are tougher to find and, generally, carry a little more value. Mike Stenhouse, card 29, can be found with or without a number on the back. Card 30, Ron Darling, has a similar variation. The checklist configuration is fairly standard for a 1980s Donruss release. The painted Diamond Kings lead off the set. They're followed up by 20 Rated Rookies. The main part of the set doesn't have any other subsets, although there is one non-player card. The San Diego Chicken bookends with the final card. There are also seven checklists that have no numbers. These are usually considered to be part of a complete set. The release has two insert sets. The first is a Duke Snider puzzle. These painted puzzles were a hallmark of Donruss baseball sets for much of their existence. More curious are a pair of Living Legends cards. Numbered A and B, each has a pair of legends who completed their careers in 1983. The first has pitchers Rollie Fingers and Gaylord Perry. The other features Johnny Bench and Carl Yastrzemski. 1984 Donruss Baseball wax boxes have 36 packs of 15 cards. 1984 DONRUSS Don Mattingly RC, GMA 8.5! MARSHALL EDWARDS 1984 DONRUSS SIGNED AUTOGRAPHED CARD #490 BREWERS TOUGH! 651 cards, seven checklists, two Living Legends. Some guy names Darryl Strawberry also has a rookie card in this set. 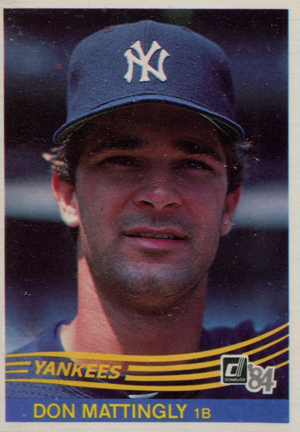 Trey (ID 90461) � He was also in 1983 Topps Traded. The RC vs XRC thing is fickle and people could go either way. With the marketplace the way it is today, it’s not like the Traded sets are tough to come by even more. The hobby should have retroactively made the first major issue (Topps, Donruss. Fleer, Score, Upper Deck, and Bowman) card release as the RC. Regardless of base set or Traded/Update set. Would make the designation far simpler.